This past Saturday, I visited the gardens of one of my aunts. My aunt has been gardening in the same place since the late 1950's. She has a little bit of everything and all of it looks so nice and well-tended. Even though she uses a walker to get around, she has figured out how to use one of those rolling seats to get around her flower beds to weed, prune and plant. The picture above is one of her flower beds in the back. There are all kinds of flowers in it, including some very impressive Baptisia, False Indigo. She had several Baptisia plants throughout the garden, all big and full of bloom. I like to visit gardens that have been cared for and loved by one gardener for so long. My aunt probably knows every inch of that garden, where the water stands after a rain, where the sun is at a given hour, when everything blooms. 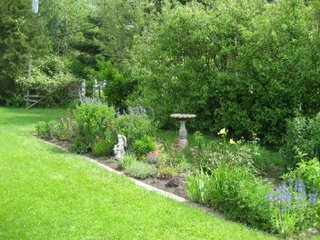 She knows the rhythm of the seasons in that garden, when to plant and when to prune and how best to put it to bed for the winter and what to do first in the spring. I'm sure through a lot of trial and error, she's got it figured out, yet like most gardeners, she probably also learns something new every day she works in the garden. I certainly did not leave her garden empty handed. She let me dig up some mums that came from my grandmother, a start from an old rose that was on the property when they had the house built (left over from a farm that had been subdivided to provide the lots for the neighborhood), bee balm and lily of the valley. I already have some lily of the valley, but wanted some that she said came from my grandmother’s garden. I also cut off a branch from her money plant (Lunaria) for the seeds. And, she gave me a few pots of rain lilies (Zephyranthes) and a night blooming cereus. The night blooming cereus is what originally prompted the garden visit. My aunt wanted me to take it because it is a big gangling plant. She couldn't deal with it any more and yet she could not just pitch it. She started it from a leaf cutting my Dad gave her, so it is probably at least 20 years old! We went from spring to hot summer, all in a day. It was 89 degrees yesterday and just as hot today. The violas certainly don’t like the heat, so they are just about done for. I’ve put more garden cloth over the raised beds, because I think it is really helping to keep the rabbits out. So far, so good. I hope in a week or so, I can remove the cloth and if the rabbits do some nibbling, the beans and corn will be big enough to survive it. If anyone has experience using this cloth and can offer some advice, please chime in. I would love to have tended the same garden for so long. I always tell my husband we can never move now, because it takes gardeners years to achieve true success!